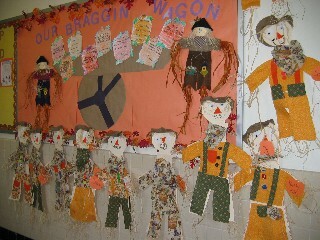 Check out the new Mathwire collection of Fall 2007 Math Activities. The Math Activity Theme Series is designed to collect all Mathwire.com activities on one page for easy reference by teachers using a themed approach. It is also an easy reference tool for teachers who are looking for seasonal games, problem solving tasks, math-literature connections, or other math activities to add to math centers, Do Nows, weekly problem solving challenges, etc. to capture student fascination with seasonal topics. The Math Activity Theme Series currently includes Bat Math and Spider Math, just in time for October and Halloween math activities. Each page is a collection of current Mathwire.com activities but some new activities were developed for each collection, so be sure to check each page carefully for both new and old themed activities. This themed series is currently in development. Look for new themes to be added over the coming months. Check out the new Mathwire.com Math Activity Theme Series. 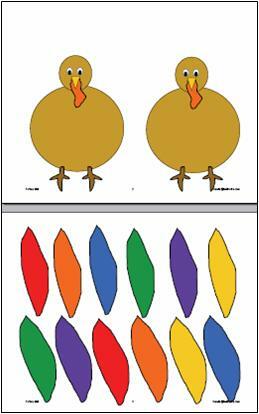 Counting: student rolls a die or selects a card, and places that many feathers on one turkey. The student rolls the die again and places that many feathers on the other turkey. The student should then count the total feathers and either write or select a number card to express the total. Write Number Sentences: the student follows the same procedure as above, except that he/she writes a number sentence to describe the results of the dice rolls. See Leaf Mat for an example of a prompted number sentence mat and recording sheet. Insert both in sheet protectors and provide dry erase markers for students to use. Quick Counting Game: student pairs each follow the procedure for rolling the die, placing that many feathers on the first turkey, etc., writing a number sentence or selecting a number card. The student with the larger number wins the game. Or, use a More-Less Spinner to add more suspense to the win. After students finding their totals, they spin the More-Less Spinner to determine who wins the round, adding practice of another math skill to the quick game. Crazy Spider Mat: students use small pipe cleaner legs to create crazy spiders. First die roll tells student how many legs to add to one side of the spider. The second die roll tells students how many legs to add to the other side of the spider. How many legs does his/her spider have in all? If it's not 4 on each side, then the student has created a Crazy Spider. Glyphs is the most outstanding resource on this topic!! Games and activities on this Manitoba education Mathematics resource site are available for downloading as Word or pdf documents. These include activities and games for the classroom and for home use. There are many favorites but also some new twists on primary games. For example, check out Squeeze Play and Good Riddance in the Home section to add to your classroom collection. Check out Squeeze Play, a game using regular playing cards, which reinforces number sequence. Take a look at Good Riddance Game which provides lots of addition facts practice. View All Games and Activities available on this site. There are great online resources for the classroom calendar routines. The following represent a sampling of some of the best. Bookmark these sites for future reference. These online math dictionaries are great as resources for teachers, students and parents. Check out A Math Dictionary for Kids 2007. Simply click on any letter to bring up a list of math terms. Clicking on any of the terms brings up definitions with diagrams for better visual presentation. Harcourt's Multimedia Math Glossary is available online for students in Grades 1-8. First click on the appropriate grade, then select a letter to bring up the math terms in the glossary.